Maybe I am the blind one"?" Could you give more information? Please! 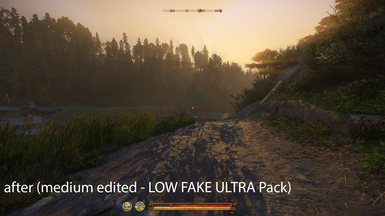 More precisely, your file is more FPS demanding than Vanilla High Shadow + HD Texture one. I compared again the 2 files, and your one contains higher value some variables. Please update this mod or let us know the commands to enter into the user.cfg, this was the only thing that made my game run flawlessly. Hey, I'm curious as to what causes this. On low, it looks nice yeah, but on the sides of my screen the shadows almost kinda jitter, like a shimmering in a way. Same with in the distance. It's not abtrusive or really bad but going from low to medium, medium doesn't do that. Even with my 4770k and 1080 ti I cant run 60+ fps but on low shadows I stay around 65-70. So is there a value I can change that gets rid of that shimmering? Tried turning jittering from 1 to 0... nothing. Any other values that might affect this? Same issue, shimmering in distant shadows. 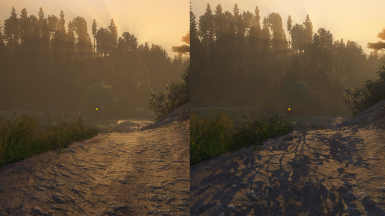 I also failed to notice any noticeable performance increase between med-high, doesn't seem to affect quality that much either, shadows are a little more darker with the mod perhaps. Can i put the command in user.cfg without change the engine.pak? I tested, i think it's work. Hi Nihio! I would like also to use your tweaks via a user.cfg file. Would appreciate greatly if you could post the commands that you changed if you don't mind. Thanks! Please can you let us know the commands to enter? I can no longer edit the engine.pak file and it would make a lot more sense to have this mod as a user.cfg edit. Can you post the changes you made in user.cfg? It doesn't allow me to change/edit engine file. Anyway to get this to work for the new patch? For me it broke the lighting in the game. Uhhh This Mod can use with Optimized Graphic Presets Mod? Did you upload the wrong file or something? 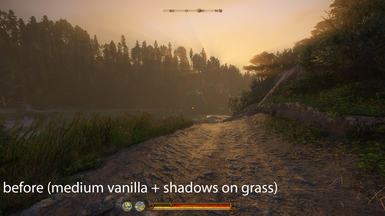 I compared both the Shadows on Grass - Standard and the LOW FAKE ULTRA pack and apart from a few lines in the low preset they are identical.Which means the distant shadow part of your LOW FAKE ULTRA Pack doesn't work at all as far as i can see, most likely cause you didn't modify e_SunAngleClamp (which is the setting that makes these shadows appear) in the low and medium profiles, after i set it to e_SunAngleClamp=10 in 1 and 2 like in the ultra profile the distant shadows appeared correctly(with basically no performance cost as far i can see). Anyway dunno if the author will be back but maybe this helps someone else. Thanks for the heads-up, that did indeed add distant shadows, and with no noticeable fps loss. I don't know why this still hasn't been fixed, but I've re-downloaded this a few times due to needing to re-install and your fix has helped me many a time, pantsyman, so thank you! And thank you Nihio for the initial changes to begin with! Anyone able to open engine.pak and copy or edit files inside since the latest patch? Before it I had no problems, now its refusing to edit regardless of what I do. Anyone tried it out for 1.31? Still works but you have to redo it since the patch updates engine.pak, you should apply the fix i posted below if you want the the distant shadows since he has still not updated it with the correct values so far. please, can you tell me where that .ini file is? any suggestions what i can do to install the mod or how to create the "config"-file?